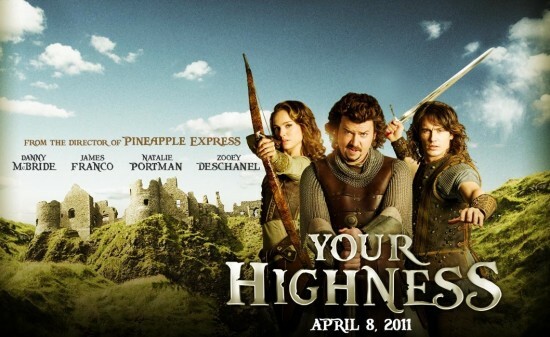 My only explanation for this abomination of a film is that it must have been a favor to Danny McBride. McBride has been a strong supporting character in many successful comedies in the recent years, and has even had a few memorable leading roles, mostly with the help of director Jody Hill. After the breakout role in Hill’s first feature, McBride was also cast as the lead in the HBO television series “Eastbound and Down.” Hill brought filmmaker David Gordon Green into this series to produce and direct select episodes, and he had also worked with McBride on the successful Pineapple Express. David Gordon Green seemed to be making a departure in style when he agreed to direct Pineapple Express, but somehow he managed to make the Seth Rogen stoner comedy still feel like it was his. The same can be said of the episodes of “Eastbound and Down” directed by D.G. Green. So why is it that the talented director seems completely absent from this abysmal action fantasy comedy? The only explanation is that he was merely doing the film as a favor. Let’s hope this mistake is not made again. McBride co-wrote the screenplay for this R-rated fantasy comedy, and it definitely reeks of his adolescent sense of humor. The trouble is that it never really matches the production value in laughter. Fantasy comedies have a long history of failing in the box office, and this one appears to be meant only for fourteen-year-old boys. Filled with boring moments interjected by crude sexual humor, Your Highness is a disgrace to everyone involved. And what a cast to waste! McBride stars as the lazy and incompetent second son of the king, Thadeus> Thadeus is always second to the noble knight and prince, Fabious (James Franco). When Fabious loses his bride (Zooey Deschanel) to an evil wizard, the brothers set out on a quest to retrieve the virgin bride. Along the way they meet up with a warrior woman (Natalie Portman) also seeking revenge against the wizard, and the three pair up. This simple storyline is inserted with juvenile humor and disgusting situations, none of which are remotely humorous.